Thank you SO much for writing this, I completely agree with you. There is nothing wrong with enjoying chick lit, but I constantly feel less worthy for loving the genre rather than snuggling up with Crime and Punishment, which I read and enjoyed but certainly not as much as the latest Gi Fletcher book. Reading for me is an escape. I do agree with you that the endings are generally unrealistic, but like you say - isn't it a good thing to share a little positivity when sometimes the negativity around us gets too much? What a brilliant post! I often alternate between books - sometimes opting for something heavier going, sometimes picking out chick-lit. I don't mind chick-lit now and again, especially at times when I just want to relax - it makes perfect holiday reading! Sometimes I find the stories predictable which is either a good thing when I want an easy read, or a bad thing when I really want to get into the story! All books have a time and a place and it's far better to pick up a book than spend all day mindlessly scrolling through a social media feed! I don't read loads of this type of book (but then, I don't read LOADS) but I find the label so dismissive, patronising and not a little bit sexist. It's an easy way to write off books written by women - and, more importantly, books that focus on women's lives. 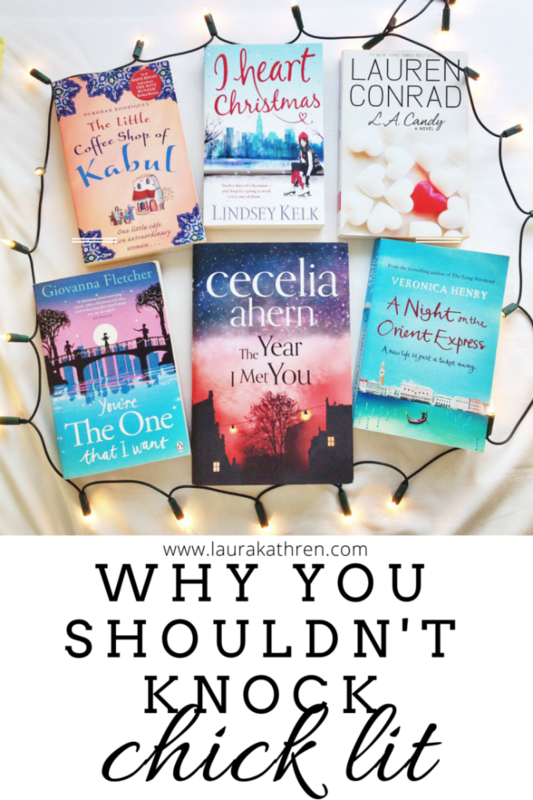 My sister's a huge Cecilia Ahern fan so The Year I Met You is probably the last book that could be written off as "chick lit" that I read - and it was a book that dealt with redundancy, disability, mental illness and featured all three of a convincing male-female friendship, a convincing intra-racial couple and a really touching sister relationship. Jonathan Franzen writes about the minutiae of people's day to day lives and relationships and never gets labelled chick lit - I wonder why?